I'm new to the Minecraft scene, but, after seeing the inflow of skin editors and not being very satisfied with them, I decided to take matters into my own hands and start developing programs for Minecraft. My first release here, I present to you MCSkin3D: a 3d, real-time skin editor for Minecraft! I consider this one of my first "public" programs, as in one that I've released directly to a large community - hopefully it's well-received and I hope you guys don't go too hard on me, but, here we go. MCSkin3D was inspired by several sources, notably Q2MDL, an old Quake 2 skinning tool, SkinEdit ([url=http://www.minecraft...alpha-3-pre-7/]http://www.minecraft...ha-3-pre-7/[/url]), an excellent 2d skinning program for Minecraft, as well as modern editing tools such as The GIMP. Before attempting to use the painter, please go through the View options and get to know them. MCSkin3D requires that you have the .NET Framework version 3.5 installed. A Linux and Mac port is in the works! The program should be self-explanatory, and I made sure to tooltip any important things. When in camera mode, left mouse button rotates the camera while right mouse button (or mouse wheel) zooms - in paint mode, right-mouse button rotates while middle-mouse button will zoom. The samples are now not included with the program, and are extra downloadable updates. Check "Help < Check for Updates" to download them automatically! Apparently, someone down at Mojang changed the model format in 1.9/1.0 and rotated/flipped the bottom of the chin. You can use the tools under "Options" to flip a skin automatically. Windows asks for permissions or "elevation" when trying to run it! This is normal - if you used the default setup directory, Windows requires permissions to run anything inside Program Files. If it won't run at all, try running it as an administrator via the right-click menu. It says Swatches/Skins are missing! Why does the drawing mirror on the arms/legs but not anywhere else? Drawing on the model draws directly to the texture map - if you check the map, there is only one arm face, it's just mirrored to the other side. How do I draw on the head? Disable the helmet, either in View < Visible Parts, or on the toolbar near the top-right. I want to draw on the sides of the legs or arms but I can't get to it! You may uncheck other pieces in "View < Visible Parts". To get to the backs of arms or legs you may have to uncheck the other leg or the chest. I try to upload the skin but it just says it failed with "The operation has timed out"! Minecraft.net must be experiencing some high traffic - try connecting to the site with your browser and see what happens. It may take multiple attempts to upload it, or you may have to wait until traffic slows down (the timeout time is 10 seconds). An exception dialog popped up, what should I do? Hit "Save", save the report and attach it to a forum post here, or email it to me, and I'll get right on fixing it. How does the program handle passwords? Passwords are saved locally, in settings.ini, encrypted in 256 bits using seeds and salts from constant data relating to your specific machine - using this technique, even if someone gets a hold of your settings file, they would need access to your physical system to decode the password. No password, usernames, or user data is sent externally at any point, except to connect to Minecraft.net using a secure HTTPS connection. Source code is available upon request if you wish to challenge this remark. If it's not listed above, I either forgot about it or it hasn't been brought up yet - suggest it! - 1.8 skin format support. - Fixed a major memory leak. -- I removed a lot of useless, bloat features. -- A few were watered down to be more simplistic and fit for compatibility, such as updating. - Fixed a few swatch editing quirks. - Added an orientation indicator (non-customizable right now). - External change support (modifications done outside of the program are picked up and reflected). - Fixed M_UPLOADRES not appearing in all conditions. - New zooming for 2D mode. - Custom model support, model dropdown, etc. - Added support for .gpl, .gimp, .aco and .act swatch formats (GIMP and Photoshop). - Fixed color sliders not working on non-VisualStyle-enabled systems. - Added HSLA as one of the alternatives to RGB. -- There seems to be some extraneous operations going on there that cause it to be slow, too much floating point math? - Added eraser, dodge and burn (also known as highlight and shadow) tools; note that dodge/burn is at a fixed 25% exposure at the moment. - First release, nothing could of changed, silly. Make sure to give me any feedback or any issues you may encounter. Awesome people, show your love with this amazing banner! cool. I've been looking for this. Well, actually my reason for making this program is the fact that we have too many of these. I've tried four or five different skin editing programs (and I'm not an artist, let's get that clear first, I'm a programmer!) and they all have very different feature sets, or are extremely outdated (not that skin editors NEED to be updated to newer versions but they still lack any new features). I'm hoping to create something that is more universal and works for everybody. Some people like that tool, some people like this tool, but everybody likes THIS tool - know what I mean? Well, I know it's new and all, but if you really want to compete with the current skin editors... you really need to come out advanced if you want people to think about switching from a stable, easy to use programs like MCSkinedit to your program which currently doesn't have many features yet. - There aren't any shortcuts. (or any I could find?) No ctrl - Z so I can't undo any errors. - No swatches. Makes it inconvenient to switch to basic colors like red, purple, blue, etc. The "animate" model isn't very useful. I would rather have selectable poses with the arms extending for an example. So, it would be much easier to see what I'm drawing under the arms. It would also be nice if you featured a mini previewer in the 2D window... so we know exactly how it looks instead of switching over and over from 2D to 3D. Unless you made a shortcut for that. Overall, I won't be switching to MCSkin3D right now. Maybe if more features are improved on it later, I might. I'll really like to see how it progresses though. Shortcuts are on the todo - I've been kind of pushing to get it out here because I have a tendency never to do so if I don't do it soon enough. Swatches are planned, and a bit of the base is there, the issue is trying to find space to place it. I've kind of crammed things in there as best as I could (UI design isn't my forté). The previewer was also mentioned as well, or some sort of method of seeing both at the same time - not sure exactly how I'm going to approach that at a presentable level yet, but I have it down here. Keep in mind, you can easily uncheck other parts to get a close look at a single piece (ie, under the arm, as you say). Posing is a possible future feature; the purpose of the animation was to mimic the running animation of Minecraft (that's all you're really gonna see in-game anyways, so I didn't see the point in adding the flail-arms-everywhere animation that Alpha boasted). Fair enough, I don't expect any switches just yet - if anything, I'd just like to get it on notice so I can develop something that I feel will help skin developers, especially with a functional 3d painting program. It won't get anywhere unless I get feedback from artists like yourself who can help me figure out what goes and what stays. EDIT: Oh, about the undo/redo: it's there on the toolbar, but yes there are no keyboard shortcuts just yet. After making so many programs that I never released, I never realized how much of the easy stuff I've left out... I need to taze my beta testers more. EDIT2: Did you mean dodge/burn as "shading/lighting" or actual lighting on the preview? Nice tool Paril. needs a more cool background. This looks very nice. Would love to see this become the #1 used skin editor out there, but you have a long way to go. Thanks; I'd love that too, and I'm willing to put in the effort to ensure it happens! if you are going to add shorcut keys maybe adding more rather than the basic Ctrl+X for cut maybe Ctrl+P for pencil etc something like photoshop has where every tool has a shortcut. I will make sure every feature has a shortcut, and the shortcuts will be customizable by the end-user (I'm used to Visual Studio having like, over 100+ shortcuts, so I tend to pick strange combinations). Version 1.1 is in the works; so far, swatches have been implemented using a simple ASCII .swc file, a couple little quirks have been fixed and nearly all of the functions have a shortcut, as well as making the RGBA color picker a lot simpler to use. An eraser tool will be added, and the pencil will no longer overwrite colors, rather will blend them together like it should. I should be ready for a release some time this morning. Of course I don't mind, I encourage it! i look forward to seeing progress with this program :smile.gif: what version of studio are you using 2010? Yessir. C/C++ is my main language, but I prefer C# for rapid application development purposes (I honestly got most of this program done this entire week, and nearly all of the features mentioned above in a few hours). A new version will be out in a few hours or so - something of an interim version to get rid of several things that were mentioned above. Nice, looking forward to seeing it. I'm surprised you're updating so quickly lol. They don't call it rapid application development for nothing! Hey guys, version 1.1 is out, give it a try and report any new bugs I created! You managed to remake skinedit? It's not really a copy, but it is similar. I think it's good that MCSkinedit gets some competition. Competition always gets people to work harder and improve on their work. Great that you stuck in shortcuts, but they are hard to reach. Ctrl + shift + e makes it a bit inconvenient for your fingers... especially if you're trying to draw. How about just shift + left click for an example for the dropper tool or right click to erase. Other features like burn and shade tool just holding down ctrl + left click to shade, ctrl + right click to lighten. It's just a bit hard to reach with ctrl + shift + y if you know what I mean, lol. I really do like the camera movement. It feels very easy to use. That's about it. I don't feel like I have the right to suggest too many things, but I am trying to help you improve on it. Just... from an artists point of view anyway, if I were to use the program seriously. Shortcuts are modifyable via options. As strange as it may sound, I hate keyboard shortcuts and I almost never use them aside from the basic operations, so it's a little tough for me to figure out the best default setup, so I made sure that it's customizable down to the last control. Speaking of Dodge/Burn, would it be more efficient if it was one tool and it used a modifier for the operation? I was kind of going by Photoshop/GIMP, but, maybe that would be easier for you guys. Would you care to at least TRY the program? You would see right off the bat that MCSkin3D has quite a different toolset and a focus on THREE DIMENSIONAL skinning rather than texture mapping. 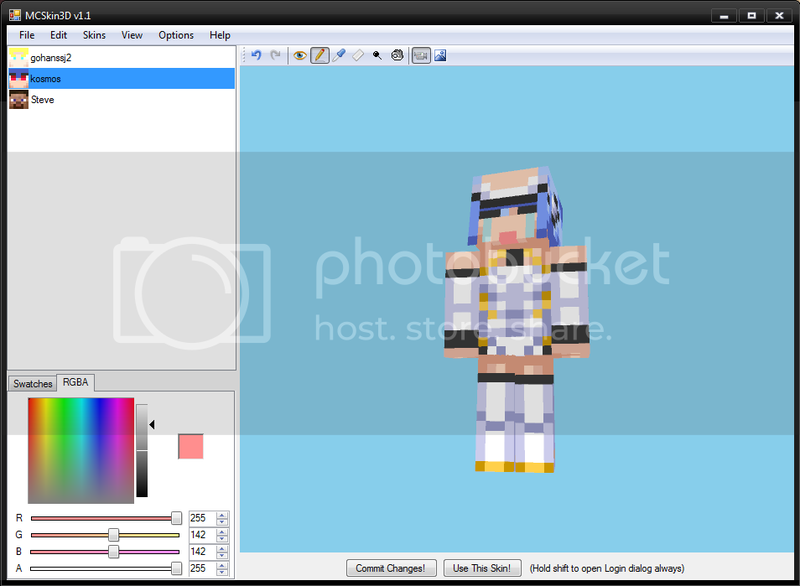 While yes it does have texture skinning, that's just an obvious addition due to the fact that it's a skin editor. I'm sorry if swatches, colors and a pencil is stolen from MCSkinEdit, but it seems to me like nobody would use my program sans them. Another useful thing to point out is that MCSkin3D is also a skin management program, letting you easily store your skins in a safe place (separate from your main "skins" folder you may have elsewhere on your harddrive), and also let you directly upload to Minecraft.net in the click of one button. And MCSkin3D is easier to handle than Skinedit. I appreciate the comment, let me know if there's anything that can be done to improve your skinning experience. If you try to undo or redo when there's nothing there, it'll cause problems. Sometimes it's hard to replicate, but just spam ctrl+z, and believe me, it'll happen. Often times I'll spam the ctrl+z button until there's nothing (and then some), so I found myself having to press okay a few times while starting to make a skin. I'll show what I managed to create next post, just thought it was a good idea to throw this error out there. Anyway yes, that is a little issue I have figured out. Oddly enough I created it while I was creating the keyboard shortcut code.